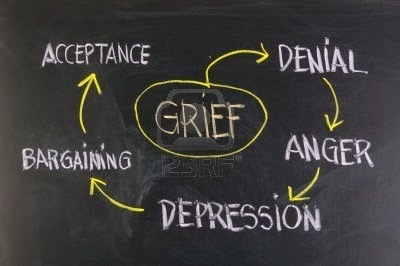 The counseling profession identifies five stages of grieving. Someone who suffers a great loss will first deny what has happened, then feel anger (usually misdirected) and depression before attempting to deal with the situation through ultimately futile bargaining, before finally accepting the new circumstances. Examining reactions to the 2015 Hugo Award nominees, I noted that many commenters reacting negatively to the broadening of the electorate and renewed diversity of the nominated works are speaking from positions informed by one of the first four stages of grief. The Psych Central article linked above describes denial as a normal defense mechanism employed to block out facts and words that may cause painful emotions. Few descriptions of Isabella Biedenharn’s hastily retracted Entertainment Weekly piece are more apt. A time comes when denying the loss is no longer possible. This is when anger sets in–directed irrationally and often indiscriminately at friend and foe alike. The term “textbook example” is overused, but it describes K. Tempest Bradford’s profanity-laden rant to perfection. When anger has passed, the bereaved is confronted with his own vulnerability and insecurity. He may begin second guessing his and others’ decisions in an effort to regain some semblance of control, or seek to make some kind of deal in the false hope of cheating fate. Former Hugo winner John Scalzi’s recent post chiding Brad Torgersen’s alleged negligence for not warning all SP 3 nominees about the reprisals that Mr. Scalzi and his confederates are themselves causing places him squarely at the bargaining stage. Subtly urging the nominees to renounce their nominations is a definitive symptom. As for depression, the header image and emoticon which the esteemed George R. R. Martin uses in his initial post on Sad Puppies 3 say more than words. What do all of these reactions have in common? They’re all based on emotion rather than reason. John C. Wright has pointed out that discussions of the nominated works’ merits are few and far between. At this point, with nominations closed, the quality of the works chosen by the voters should be the main subject of debate among Worldcon members. Instead, most commenters persist in complaining about the manifest of a ship that’s already cleared space doors and is cruising at warp speed. Another observation: besides their common origin in grieving parties’ emotions, every objection to Sad Puppies 3 amounts to one thing–voter disqualification. Those in denial disqualify certain Worldcon members as racists. Those motivated by anger denounce other members as sexists. Meanwhile, some offer acceptance in exchange for thwarting the will of members who voted for certain works. Saddest of all, some see the changes sweeping through fandom–see it broadening and deepening–and in despair, believe the calumnies hurled at their brethren. Enough grieving. Let reason’s cold bright light expose all comforting self-delusions and bring all to acceptance of the truth. This is the truth: the Hugos are awarded by the members of Worldcon, convention registration is the only requirement for membership, and Sad Puppies voters are no less members of Worldcon than those who grieve at their presence. Those who would disenfranchise new members; who would relegate them to second-class citizenship in their own convention, would be better served by recognizing and accepting the indelible change they’ve wrought.